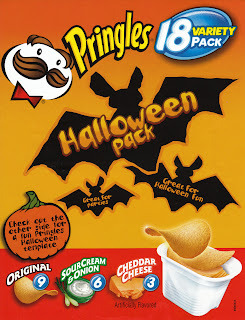 Is there really anyone out there who would use as their defining Halloween image this template of Julius Pringles, the product's mascot? That very thought is scary. That template looks less like a mask and more like the carving guide I made for my pumpkin one year: dots to mark where pinpricks go, transferring the image on the paper onto the surface of the pumpkin before carving it. 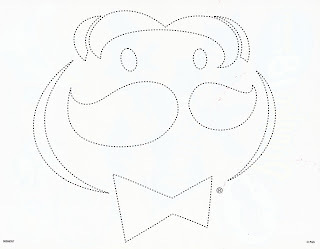 Still, who would want to carve the Pringles dude onto a pumpkin? yes, that's a pumpkin carving template. Omigod--I wish I had seen this earlier. I would have been Jules Pringles today. They could at least have given Julius vampire fangs or something.